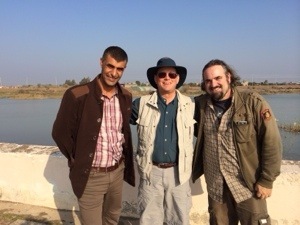 We arrived in Iraq this morning at 7:30 AM. It took 1 1/2 hours to get out of the airport while they “checked” our visas. Lots of security. So gar all is well. Our hotel is the best in Basra but I’d rate it a 4-star by American standards. 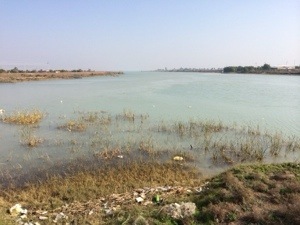 We began filming today at the Tigris and Euphrates Rivers after only 3 hours sleep. Very cool being at the very Cradle of Civilization and probably where the Garden of Eden was. Tomorrow we drive 3 hours north to Nasiriya to contour working at Ur, the birthplace of Abraham and home to the 4,000 year old ziggurat. I tried to upload a video clip but it would take all night. Dreadfully slow.